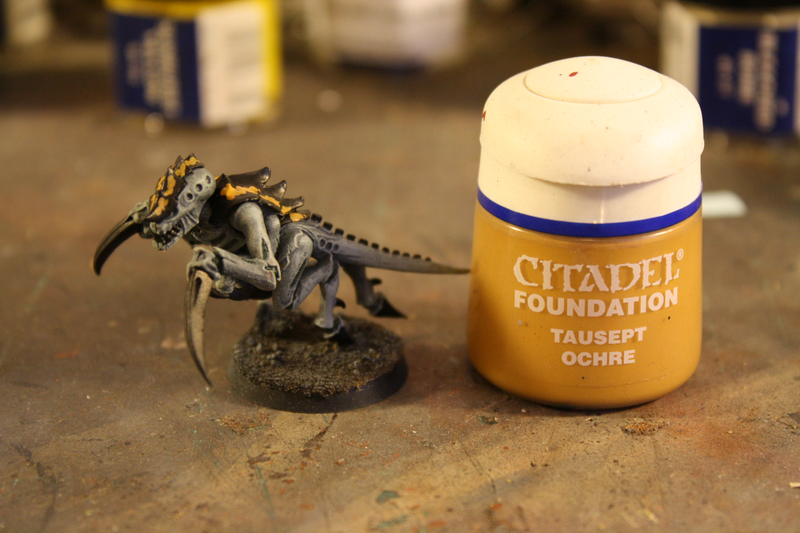 So after the recent Tyranid Army Showcase i got one or two questions about the colour scheme i used. So I've thrown together a tutorial on it! This scheme was actually taken from a White Dwarf about a year ago when the new Tyranids were first released. It was issue 361 January 2010 if you want to look it up. Its near enough the same, but mine has a few tweaks! 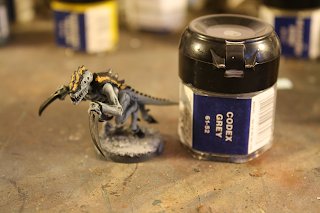 So firstly base coat your 'Nid in a 1:1 mix of Shadow Grey: Graveyard Earth. I used an Airbrush for all my undercoating to make thinks quicker. Then Drybrush the model in Astronomican Grey. Then paint all the soft fleshy bits in Orkhide Shade. You could go on to highlight these areas afterwards if you like, but i didn't bother. While the markings were drying, i went onto the base and coated it in Codex Grey. Now for the second round of markings. This time use Bleached Bone and repeated the 'dotting' along the back. For this round try to make the dots smaller than the previous set, and keep them within the boundaries of the last colour. Not essential of course, but that's just how i did it. Then finish off with the details such as eyes, teeth and any edging highlights on the claws. I also washed the base in Badab Black here. ﻿ So that's it! 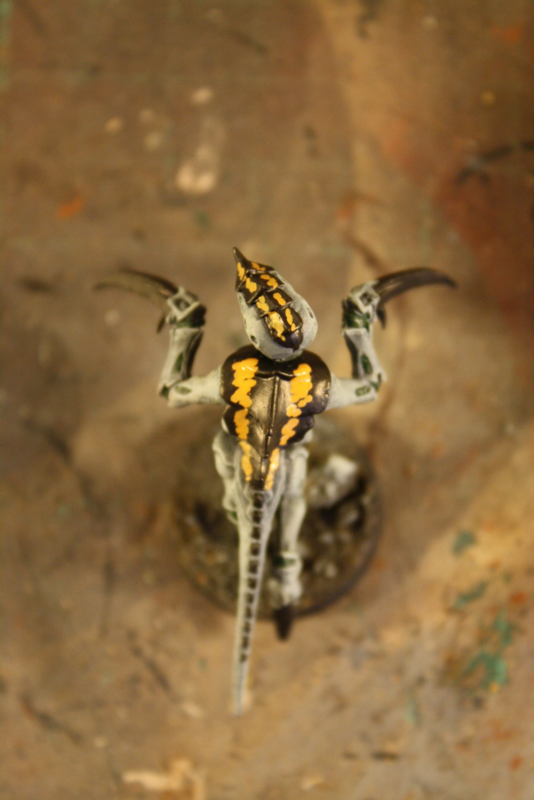 This model took me about 15 minutes to paint (less if i didn't have to wait for the paint to dry!) and i was knocking out 10 of these in a few hours. 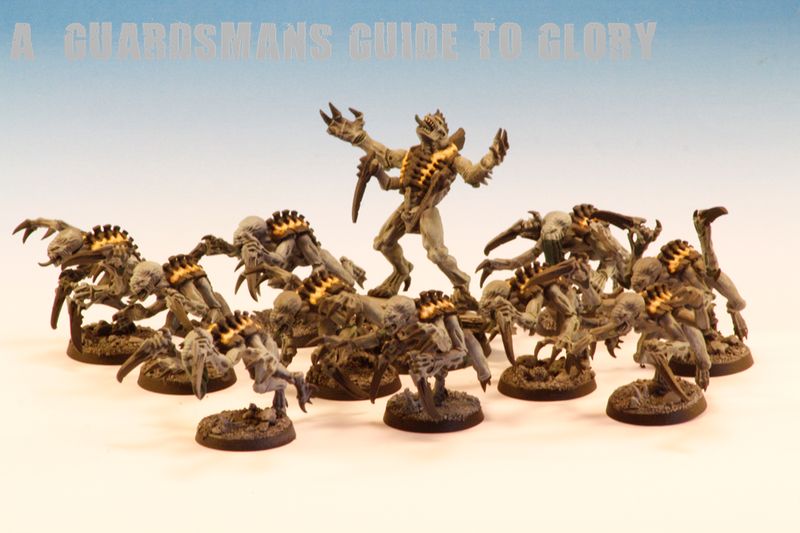 The schemes really quick and simple, not intended to win Golden Daemon awards of course, but its striking enough to keep it interesting! A dedicated painter could knock out a decent sized army of these in a few weeks using this scheme. 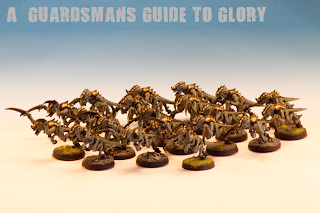 Granted it took me well over a year to complete my army, but i was distracted by a new Elysian Army at the time!! 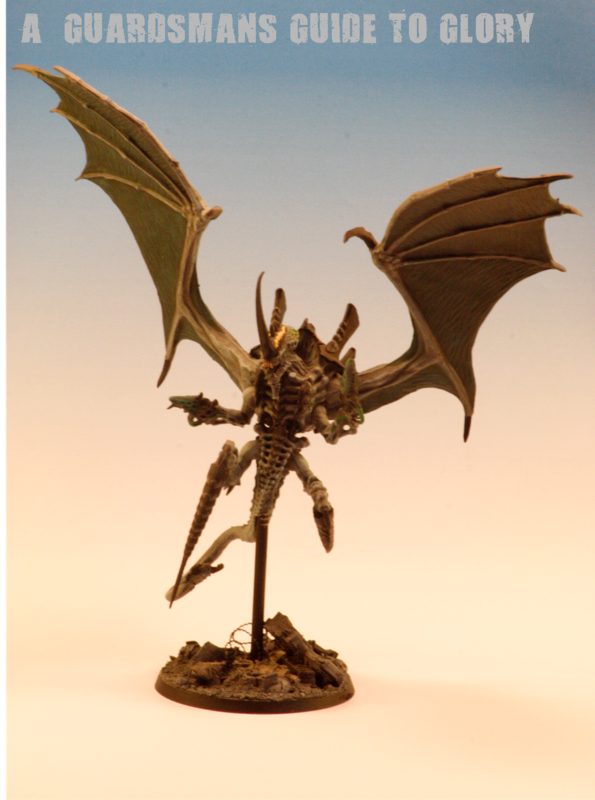 If any of you guys do decide to try this scheme on your 'Nids I'd love to hear your thoughts on it, as well as see some pics to! So this will probably be the last post for a week or two, as I'm decorating my Forge with a truckload of new painting desks, shelves, cabinets and lighting that's all arriving on Friday! So I'm clearing everything out to make ready for the delivery! Very excited! Unfortunately i still havent been able to test these guys at club yet! High petrol prices mean that im not going to club as often (yeah i know, its that bad, and my clubs 30 miles away to boot!) and 40K has largely been replaced with Dystopian Wars (that cool Naval game from Spartan Games) However, i am chalked in to play a mates Orks today after work so im hoping for some possitive results! Firstly a word on today's sad news; FTW will be suspending its service until further notice due to Ron's life commitments. A dam shame really, but its a decision I'm sure we all understand. Theres been a lack of posts lately, as i was expecting my new work desks to arrive Friday last week. So i didn't bother starting anything as I'd be clearing out the Forge ready for the delivery! Then the buggers put back the delivery date 2 weeks!! Grrrrr. So i jumped back into it this weekend and pressed on with the Krieg Armoured Regiment. Now that the 'Nids are finished, the Armoured Regiment is the last unfinished army in my collection! 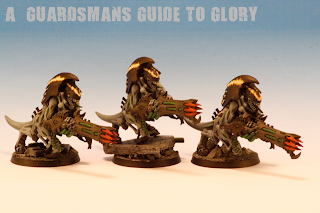 So here is the first Leman Russ Squadron, my assault squadron. 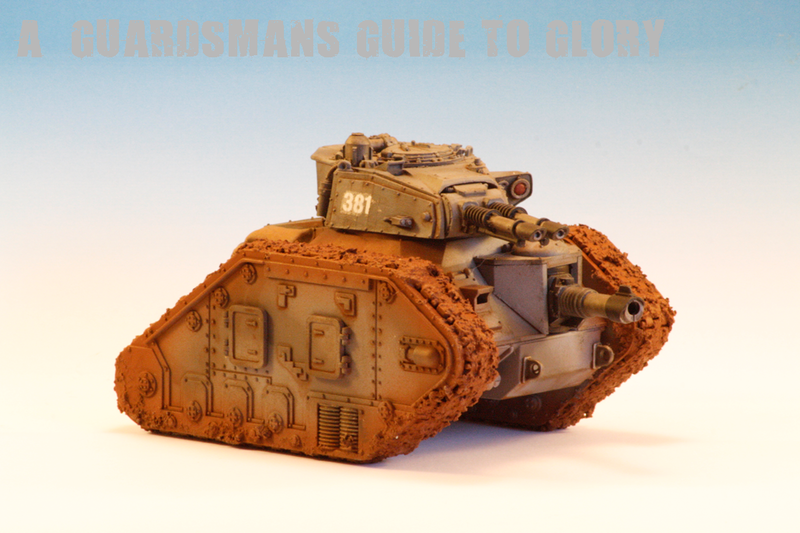 You'll have seen these tanks before in previous posts, but these guys are now sporting the new Krieg colour scheme! The scheme looks great on the armoured vehicles of this army, and I definitely rate it above the last blue scheme. I'm a little concerned about the lack of equipment on the tanks though; I think it makes them look a little uninteresting. 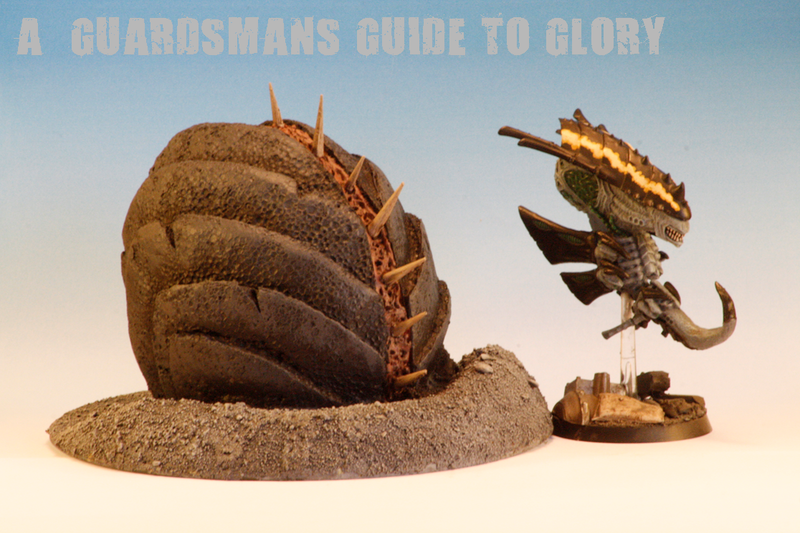 Theres only so much a Forgeworld turret can do!! I've ordered some lengths of chain to attach to the front of the hulls, as it makes sense that they would have these on board in this muddy environment! Theres some sandbags on the back of one as well, but again i think it needs a bit more! So that's where I'm at with the Armoured Regiment. 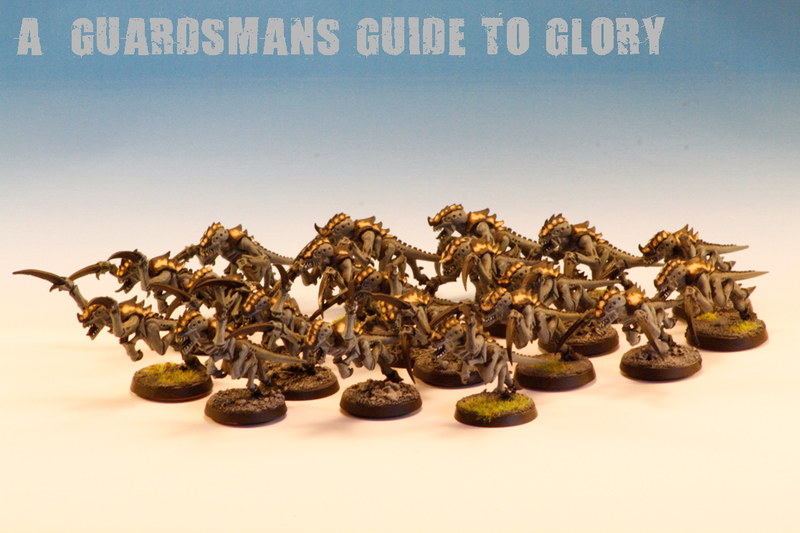 On the menu is 4 more Russ and a Hellhound! 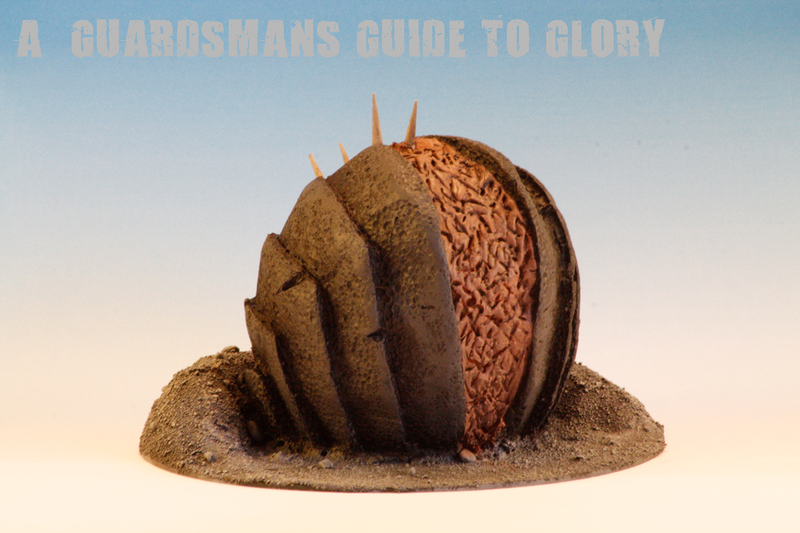 So I've decided to construct a Spore for my Doom of Malan'Tai model, as GW don't currently have a mini for it. I'm sure many-a-'Nid player is just as frustrated about this as i am! Well there is hope on the horizon with this simple and effective Mycetic Spore tutorial! 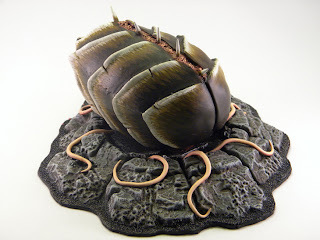 The original model was done by http://www.glaven.net/ but all he had done in the way of tutorials was simply say "I sculpted it from ProCreate Epoxy". Fine for those who can sculpt I suppose, but as I cant sculpt, I reverse engineered my own version based on his pic! Firstly grab yourself a polystyrene egg; this one only cost me 70p! Also organize a suitable base, a CD is the obvious choice. You'll probably want to check your egg for size as well! This one is the perfect size for one Doom model, but i think even the Hive Mind might struggle to get 20 'Stealers into this bad boy! So I originally intended to cover the whole egg in Milliput to make the 'leaves' of the shell, but that sounded like way to much effort! My solution was to carve the leaves out of the egg itself. This required a bit of thought in order to maintain some semblance of symmetry. Then I went at it with a scalpel. Now everyone knows that polystyrene gets really flaky when you try to cut it, so i used a new blade for this bit so i didn't ruin it! Front view. You'll see that I've carved out a strip down the middle, as this will be the soft fleshy part of the Spore. Now it was time for my mate Milliput! 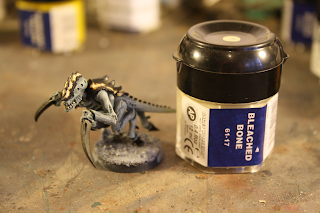 I covered the base in it to give texture, and also the centre strip and rear of the Spore. Then i just used a sculpting tool to texture the flesh sections. This is the only bit that I'm disappointed with! It didn't come out quite as i wanted, but hey-ho! 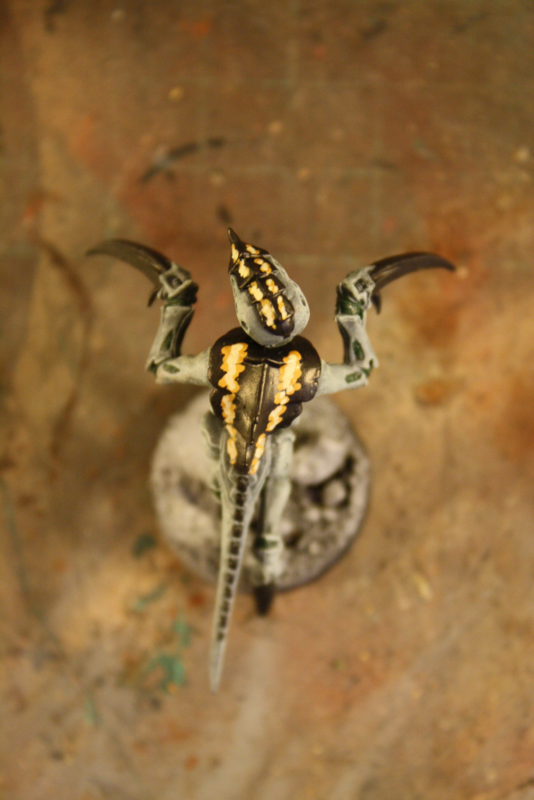 I also added the spines here, which were the ends of wooden BBQ skewers. Toothpicks would also be good, but i figured that they were a bit to skinny for this model. Then I sanded the base.Once this was done i sealed the whole thing with watered down PVA glue, as the spray paint would otherwise melt the polystyrene!! Then I painted it! I decided to leave off the yellow markings that I've put on all the other 'Nids, as i figured less is more on this occasion! 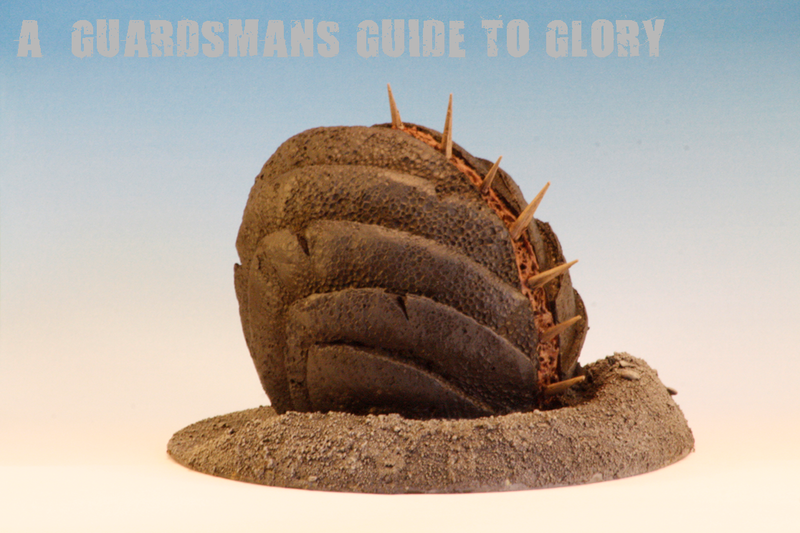 Just a little bit of grey on the edges of the shell to calm down all that black, and some sort of suitable fleshy colour down the middle! Some of you eagle eyed bloggers will notice the slight distortion on the shell leaves. This was due to the spray paint melting the polystyrene, even though i sealed it with 3 coats of glue! Its not a problem here i feel as it gives the shell a bit more texture! But it does emphasise the importance of sealing it, or your Spore will end in disaster!! 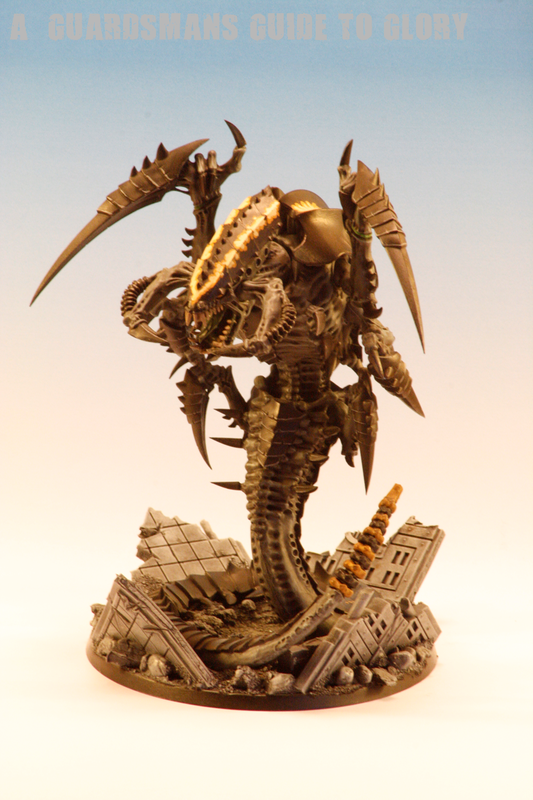 So that's the Tyranid army well and truly complete! I'll probably do a showcase on them soon. 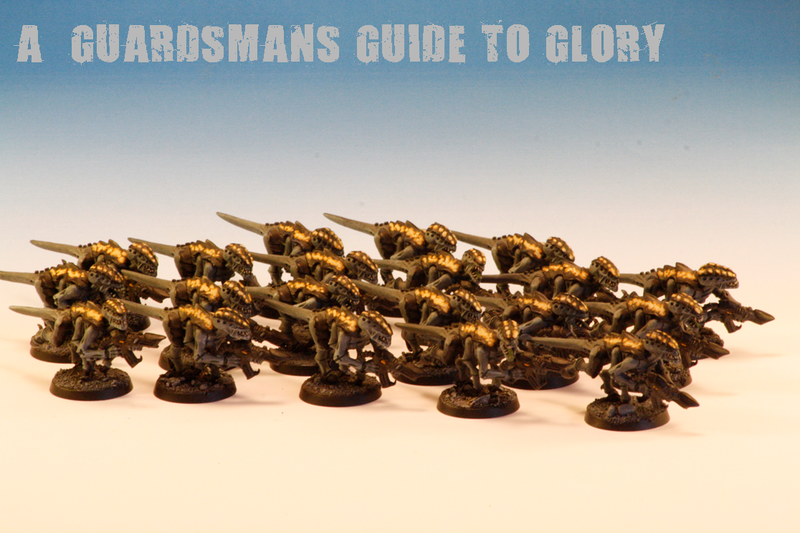 So onto the next project which is the completion of my Death Korps Armoured Regiment! Stay tuned for some armoured might - lots of it! 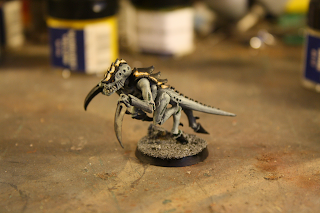 The latest and last addition to my Tyranid swarm, completing my 1750pt army! As for the 'Nid list itself. Well, after the underwhelming response to to my call for aid, i decided to go with the doom of Malan'Tai. 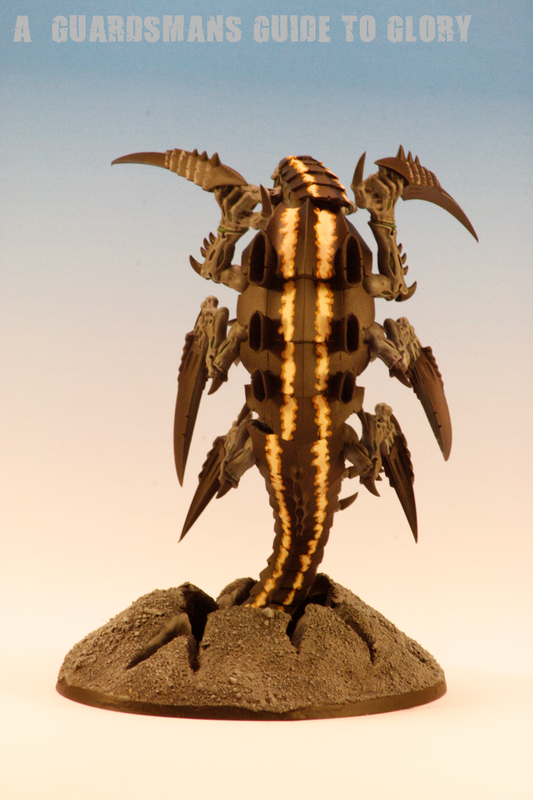 Reason being that I already had a conversion done and painted for him, and that would save me £45 on 3 Zoanthropes! I spent the remaining 50pts on another 3 'Stealers, bumping up my brood numbers to 10 a piece. 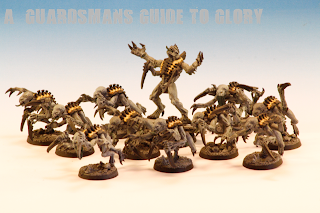 I may drop them again in favour of Adrenal Glands if the first few games demonstrate a need for them, as their points cost would cover 'Glands for the previous configuration of 'Stealers. 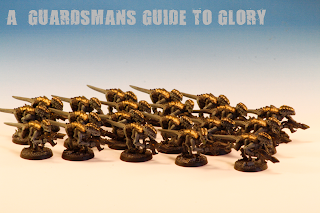 A Guardsmand Guide to Glory is 1 Year Old! 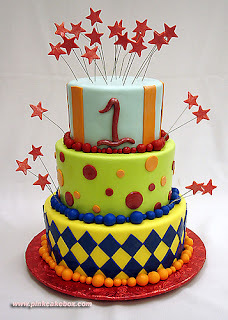 So today is this blogs first birthday! Yay! I cant believe that its come around so quickly, and that I've been blogging for that long! 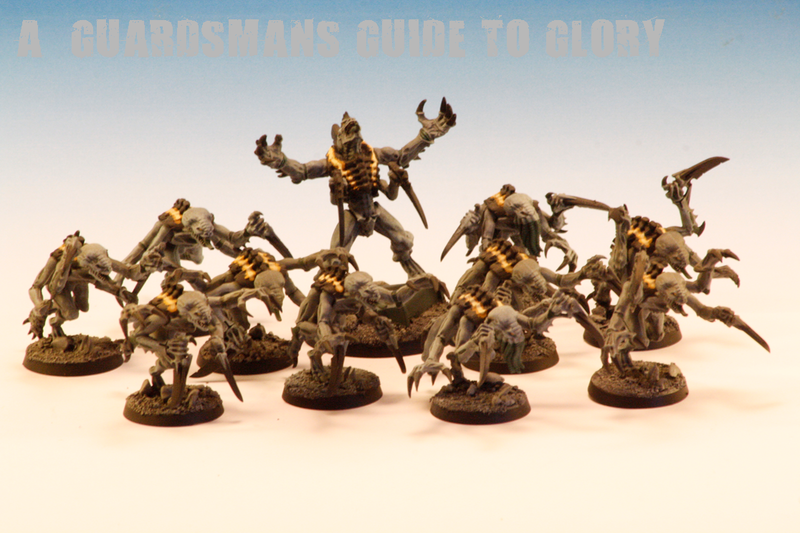 1: Completed Quartermaster (September 2010) - A great model and a great looking squad! He'll subsequently be getting a repaint soon along with the rest of the Krieg army, so lets hope Completed Quartermaster Pt 2 does as well! 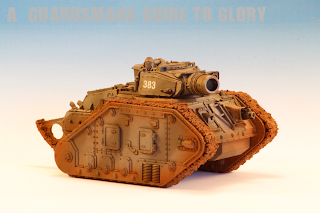 2: Legio Custodes: Painting Gold Non-Metallic Metal (January 2011) - A very recent post that sored to No 2 mainly due to the awesome publicity that FTW's "Tuesday Top Ten" provided! I think No 1 had FTW to thank for that as well! I know its not from last year, but its definately worth a mention! 3: Elysian Drop Troops (April 2010) - A surprise entry, as this post was merely an announcement that i was going to start collecting Elysians! I guess the sheer mention of their homeworld is enough to get bloggers interested! 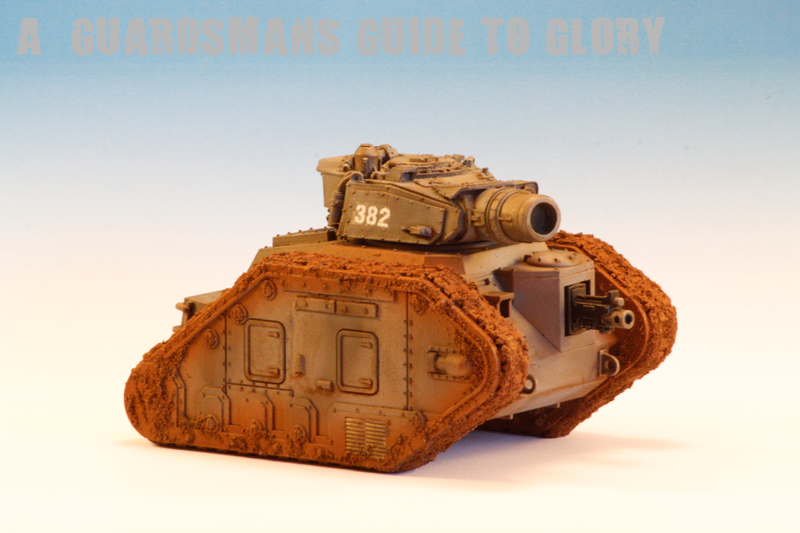 4: Finished Grenadier Centaurs (July 2010) - A quality little tank (though ridiculously overpriced by Forgeworld!) and in this post they come in two's! 5: Hive Tyrant, Doom of Malan'Tai and 'Stealers (May 2010) - This is when i first revealed my Doom of Malan'Tai conversion (well, more of a Zoanthrope tweak!) and the freshly painted Flyrant conversion! Both are now centerpieces to my (now complete) Tyranid Army, and performed admirably well during play testing! So there it is, the Top Ten 2010 Posts! I'm very much looking forward to another year of blogging and the completion of the exciting projects that I've got lined up! I'd also like to thank my modest but dedicated base of followers for their support and contributions! Here's to a hobby filled future! So while you bloggers contemplate the big question i put forward in my last post, i've got some hobby material for you to digest! 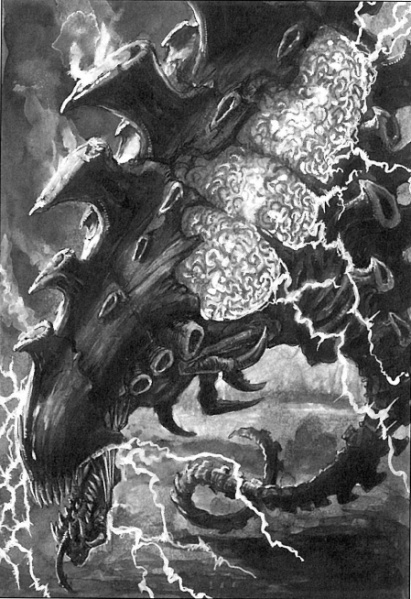 A Question on Bugs: Zoanthropes or The Doom of Malan'Tai? 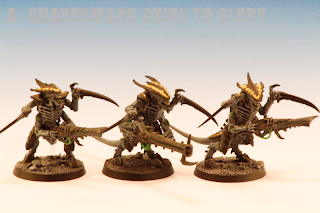 3 Zoanthropes or Doom of Malan'tai in a Spore? 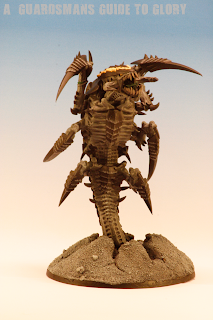 So i was thinking of dropping the 3 'Thropes (180pts) for a Doom in a Spore (130pts) with 50pts to spare. I'd then spend the remaining 50pts on 3 'Stealers with Scything Talons at 16pts each, bumping up my 'Stealer squads to 10 'Stealers plus Broodlord. That'd take my army total to 1748pts. I think that I'm just looking for a way to include the Doom as I've already done a conversion for it. Plus its a dam fun unit to field as well!